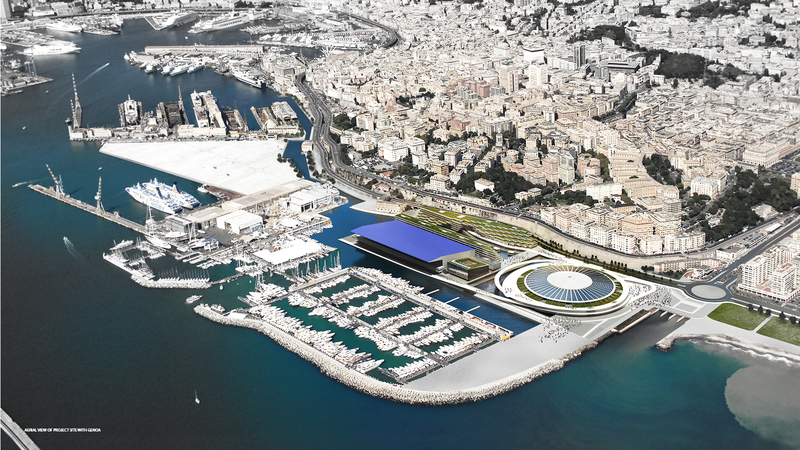 The main aim of the masterplan’s design was to animate the waterfront area in Genova by proposing a new programatic distribution with housings,office buildings,indoor and outdoor areas for different venues and a new function complementing this maritime location – a cable park for popular water sports in the region.Surrounded by port warehouses the site had also two important reference points which were carefully taken under consideration in the process – the iconic Trade Fair Pavilion by Atelier Jean Nouvel and the Palasport di Genova Arena by Leo Finzi.The building’s massing and landscape design was focused on bringing out their best features without much interference. The link between the port and historic Genova is crucial in our proposal. The fortification system from the XVII century which excavated the natural hill and created a large massive wall together with the port facility congesting the area with industrial activities barred the ancient city from its traditional contact with the sea.The design aims to restore this connection. The new approved lowered car and pedestrian path on it’s northern side would be one of the most important connections in this part of the city.From here the buildings in our design would be opening with a welcoming gesture to invite visitors to the public waterfront areas.This connection would stretch along the entire plot with special stops by the Pavilion S and ending in front of the iconic International Trade Fair building by another famous architect Jean Nouvel.This would entirely redevelop the whole area between the raised part of the city with the marina areas offering a unique opportunity to restore a seafront to the city. By bringing the water closer to the land when enlarging the marina, additional functions could be created other then operating as yet another port facility along the coast of Genova. While the open pool facing the residential area could belong to their residents who own small yachts and motorboats the other side divided by a wide public bridge could be enitrely dedicated to water sports designed as a cable park for a popular local sport – wake boarding.By detaching this part from the rest of the pool areas the quality of the closed water could be easly monitored,filtered and improved.Public spaces with adjacent programme attractors such as cafes restaurants and shops would enrich the context of not only the waterfront area but also would give a new meaning as a place of interest for the back side of the existing International Trade Fair building with vibrant areas that would be opened to the residential pool. The revival and development of this old port sector requires a radical reorganization of all its activities.The new type of sporting activities would be related to Pavilion S and its current use.It would continue to serve for different purposes such as markets,concerts and internal sport events with an additional retail area available from the raised platforms which create a connection from the street level to the International Trade Fair building.They would be not only means of circulation with multiple view terraces facing important places in the waterfront area but as well a tribune and seating spaces for spectators of outside water sports taking place downstairs. Another important matter would be the continuation of the sustainable scheme presented in the masterplan.Additionally to standard solutions with PVC Solar panels for solar energy gathering other means would be used in the design to lower the CO2 carboon footprint of the project such as green overhangs in residential areas or cooling down the interiors of large public venues by using a cooling water circulation system from the nearby located open sea areas. The massing of this important part of the programme would evoke the natural conditions present before the changes of the fortifications and creation of the port which detached the raised part of the city from the water area.The living units would be grouped and stacked on top of each other with a straight facade from the North and disolving hill alike form from the South.The block would sit on a public retail podium from the East side where the public flow along the newly created path would carve a connection with the pedestrian paths of Strada Aldo Moro.The Western side on the other hand would provide a private dock for small vessels of the housing inhabitants and collection of houses on water for short stay rental. The Palasport di Genova building would be seen as structure with vast potential.The currently multifunctional hall surface would be kept to serve different uses – from small markets,fairs to big events like music concerts and internal sport competitions and all circulation would be improved to serve those purposes efficiently.The building would be brought to life from the outside as well with an open fully glazed facade that would bring more daylight inside and would allow to create retail areas on the upper second level which would be accessible through a series of elevated ramps that would connect these areas with street level of Strada Aldo Moro and the groundfloor waterfront of the International Trade Fair Building. The rings around the pavilion would serve also other purposes than just circulation with seating areas for water sports spectators and view terraces positioned on them. The design of the two functions would be connected with each other with the main assumption of respecting the close vincinity.It’s solids and facade design would not be standing out from the building line under the cantilevering roof of the International Trade Fair facade design and would pay a special tribute to adjacent neighbour iconic building by evoking it’s angled inclined roof surfaces in it’s form. Parking areas would be positioned moslty undeground on one floor.The Main access to them would take place from the East and an additional connection along a bridge from the South side would be established for service,maintenance and deliveries. All building materials have been carefully chosen in regards to the climatic conditions. Overheating of the facades would be avoided by creating roof overhangs around Pavilion S and in every residential unit of the residential dsitrict together with green pergolas that filter air and cool down the living ambient. The design would not propose more excavated and water covered areas on the project side other then the ones suggested in the project brief.The parking structures would be placed under new buildings avoiding to transform the underside of Pavilion S which would generate big costs. The facade of Pavilion S would be kept with only the facade replaced with thermal glazing,ramps insterted in the inside and the front part excavated to improve people flow. The inside areas would be solely improved in terms of circulation by providing more access with ramps internally to the elevated second level with retail and public functions. In the North-East side a generous opening would be created which would be a welcoming gesture for a large group of visitors. Additional savings would be achieved by using the existing Pavilion S solid structure. Tension cables which would hold the outside ramps surrounding the building would be connected to it and additionally would reinforce it at the same time.The would be exposed to the outside as part of the water cablepark in front of the building. By using a modular system on a regular grid the residential blocks would be easily constructed limiting therefore costs.Part of the building elements would assembled and transported to the construction site saving funds on the transport of building materials.